I’ll give Sawyer one thing, he knows how to grab you with some good opening chapters. He excels at moving the plot along and keeping readers interested. Otherwise, I wouldn’t have zipped through the first 200 pages of http://www.Wake in one day! Caitlin, aged 15 is a blind math genius. She obsessively reads about Helen Keller and Annie Sullivan while surfing the internet in braille and using voice recognition software to post on her livejournal. Other than that, Caitlin is your pretty average high schooler. She wants to go to college, is desperate for her father’s approval, thinks boys might be interesting, and can’t live without the internet. In what seems to be a growing habit of discussing “books with pictures that are not for children”, allow me to bring your attention to the latest from Patrick Rothfuss. 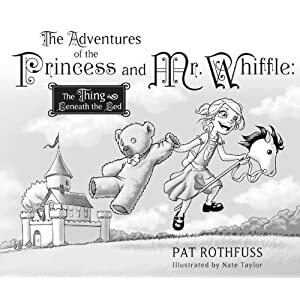 Should you be lucky enough to see a copy of Patrick Rothfuss’s The Adventures of the Princess and Mr. Whiffle, buy it. Do not pass go, do not collect two hundred dollars, and do not, under any circumstances read it to a young child, unless you’d like that child to be in your bedroom at 1:30am whispering through tears “Mommy, I can’t sleep, I’m scared”. When Rothfuss warns that the end of the book “has teeth in it”, he’s not kidding. That said, if you have one of those wonderous children who does, in fact, have teeth, and knows how to use them, proceed as you normally would. At least it will keep you chuckling until Wise Man’s Fear comes out. 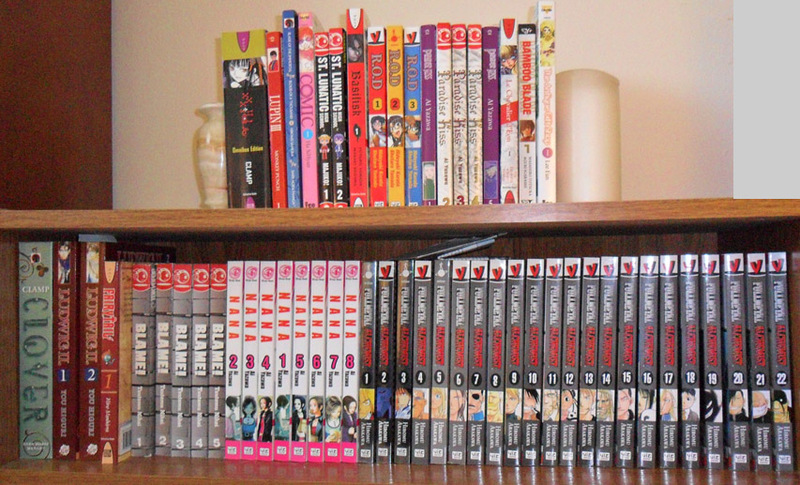 Hey, it’s my manga collection, in all its shelf and a half glory! I took this photo 2 days ago, have already added to the collection (OK, only one more manga got purchased). And there is a bunch of other random odds and ends there too that I can’t wait to talk about! My Manga post last week garnered some lovely comments along with plenty of questions, so here you go, it’s Manga 102. I’m no expert at this – fan yes, expert no, so fellow manga readers, feel free to jump in at any time! Q. Isn’t Manga more culturally specific that what we call in general “graphic novels”? If you are visiting from the Hop hosted by Crazy for Books, welcome! I try to post something every day, be it a review, or an aside, or a fanletter to an author I’m attempting to internet stalk. I do mostly scifi and fantasy stuff, heading towards the fantastical. If it’s weird, I’ll probably like it. I like Japanese Manga too. Now say it like the cute blonde on the Orbit gum commercial. . . Fabulous! Thank you to Curlygeek04 over at The Book Stop for passing the Versatile Blogger award on to me! The more active I get in the blogging community, the more I find it is a tight knit, yet friendly community of people who are interested in helping each other. And I love that. 1. Thank and link back to the person who gave you this award. Thank you Curlygeek! Love your site, especially your kindle blurbs! 3. Pass the award along to bloggers who you have recently discovered and who you think are fantastic for whatever reason! – I like cooking and I’m halfway decent at it. You’ll see I’ve passed this award onto some food blogs! I used to run a book/food blog, but I’m this close to retiring it. – Only in the last few years did I get into reading fantasy. – I start my day with coffee. every day. – My garden is making me very sad this year. Not enough sun, plus blossom end rot, plus too much humidity, plus finicky heirloom tomatoes = frustration. I’m really tempted to just rip out the tomato plants this weekend so I have more space. My garden consists of a 5×12 foot third floor balcony, and I can either have plants out there, or space to hang out. not both. – This autumn we are celebrating our fifth wedding anniversary, and have tickets for a fancy dress-up Murder Mystery! can’t wait! – I like that I live close enough to my job that I can walk there. – When I’m feeling sad or scared or anxious or depressed, I go to the university library and find books about the things that are freaking me out, and it makes me feel better. Blog on everyone, blog on! One of the most talented and underrated authors of our time, Gene Wolfe is a master of subtle story telling. The Sorcerer’s House is told entirely through letters, and if you’ve ever written a letter to someone, you know how easy that selective memory or urge to exaggerate can kick in. Baxter Dunn has just been released from prison. He needs to find a job, and a place to live, and fast. After squatting in an old abandoned house, he inquires about purchasing the property. When the real estate woman informs him that he is already the owner of the home as per the last will and testament of a mysterious Mr. Black, Baxter only appears a little surprised. It gets an entire aisle at Barnes & Noble. You can get themed stuff at Hot Topic. Kids dress like their favorite characters for Halloween. It’s Manga, and it’s worth looking into. Manga has been hot in America for about a decade now, but a lot of people still don’t know what it is, or shy away from it because “it’s just comic books”. I’ve got a nice collection of manga at home (to the tune of a few hundred bucks over six or eight years), and would like to talk about some of my favorite series on this blog. And then I realized, a lot of people don’t really know what this manga stuff is all about. So it’s time for a super basic Manga Primer.